Does it have wind chimes? Banksy's tribute to Salvador Dali. "Like my Smart clock? - It measures pulses." Baked beans in time-ato sauce. I know the feeling, 5 past 8, log on, your caption has already been posted after 6 seconds, beans flying across the room. Time to go to Barneys Beanery. "I fancy a bit of me(thane) time." Oh I'm late. How am I going to ketchup now. Can you get nothing right? It's one forty pea m.
"Right, who did this? Come on, spill the beans." "Well, I wouldn't want to smell it after it's devoured those beans"
"Has Dad left for work yet, I want a lift." "I'm afraid he's bean and gone." Whose half-baked idea was this? 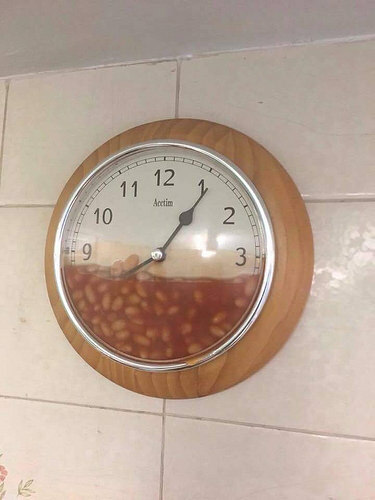 Beans keep you regular as clockwork. Looks like there was a clock up at the factory. "Just keeping my finger on the pulses," said Tim, the speaking clock. "Is it time for Mr. Bean?" Baked Beans are ideal for people who are fast eaters.